Use the link above to download the full Cockos Reaper project for my remix of Blue Lit Moon's 'Dad's Glad', as featured in Sound On Sound magazine's June 2011 Mix Rescue article. This mix was carried out in Reaper v3.75, using a variety of third-party plug-ins to supplement Reaper's own internal processing. All the project's audio files are provided in the ZIP archive's 'Audio' folder. Please be very careful when playing back this project for the first time, because if your installed plug-ins vary from mine then you may get unexpectedly high output levels from some tracks! The ZIP archive's 'Screens' folder contains bitmap images of the settings for all the third-party plug-ins I used, so you can see all my settings even if you don't have all the same plug-ins installed. I've named the image files according to track number and plug-in slot number, so it should be pretty quick to find what you're looking for. Where there's more than one important page of settings in the plug-in GUI I've created several images of the same plug-in and added a suffix letter to differentiate them. 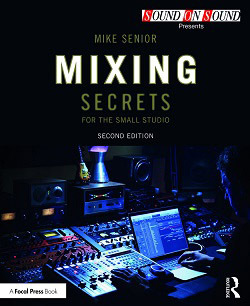 Raw Multitracks: You can find the unprocessed multitracks for this mix in the 'Mixing Secrets' Free Multitrack Download Library if you fancy remixing it for yourself from scratch. The 'Busses' Folder Track: My whole mix goes through this folder track. The MainComp track within that folder is where I apply any overall mix-buss processing. My Track Colouring Conventions: As anyone who's seen the Mix Rescue screenshots in the magazine will know, I normally colour tracks by instrument: yellow for drums/precussion; red for bass; orange and blue for guitars, keyboards, and other track fillers; and pink for lead and backing vocals. In addition, I tend to colour effects returns purple and any added audio I've put in (eg. overdubs, samples, or synths) green. My Plug-in Naming Conventions: If I've added an 'RR_' prefix to the plug-in name, that just means I've rendered it to audio, usually to preserve CPU cycles. If I've added an 'AA_' or 'PM_' prefix, that's just to remind me that I've automated or parameter-modulated some of its parameters. Number prefixes/suffixes are to remind me of any non-standard plug-in routings I've set up. So, for example, if I've renamed a ReaEQ plug-in '1+2_ReaEQ_3+4', that means that its input is coming from track channels 1+2 and its output is feeding track channels 3+4. The exciterMPS plug-in: There's nothing fancy about this -- it's just Scott Stillwell's bundled Jesusonic exciter plug-in, but I've tweaked the code to expand the range of the frequency slider. I've included it in the Screens folder for reference, nonetheless. Further Questions? If you would like any further information about this project, let me know and I'll try to add it to these notes in due course.